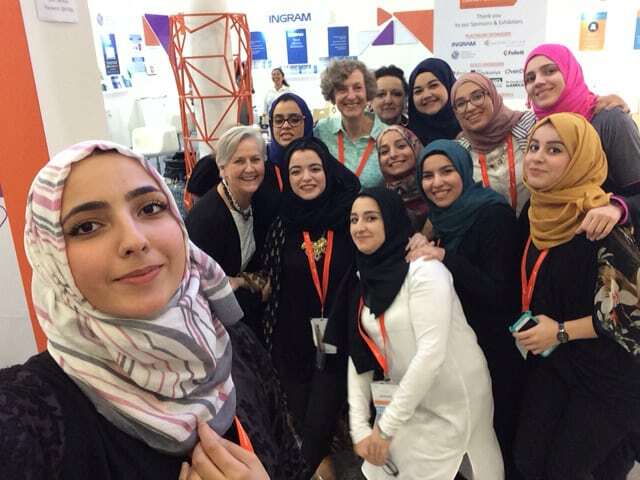 Librarians from across the Persian Gulf, Middle East, and North Africa (MENA) gathered at the Sharjah International Book Fair (SIBF) in the United Arab Emirates (UAE) November 8–10 for the third annual SIBF/American Library Association (ALA) Library Conference. 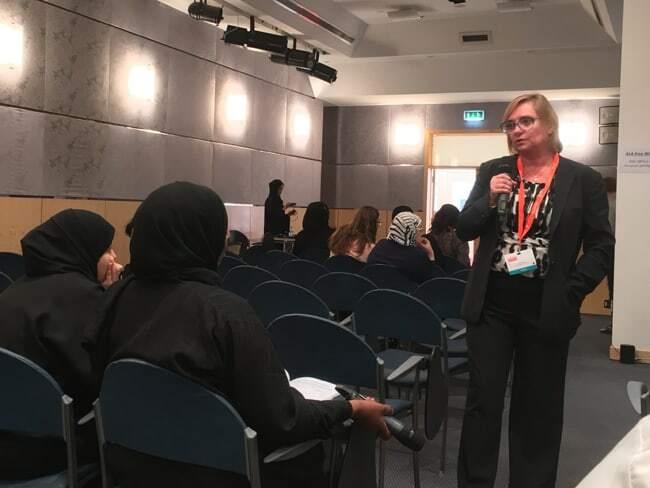 The international professional development event supports ALA’s global theme, “Partnering to build stronger libraries worldwide.” Approximately 350 librarians took part in three days of programs, training, and networking in both Arabic and English, with translation provided. 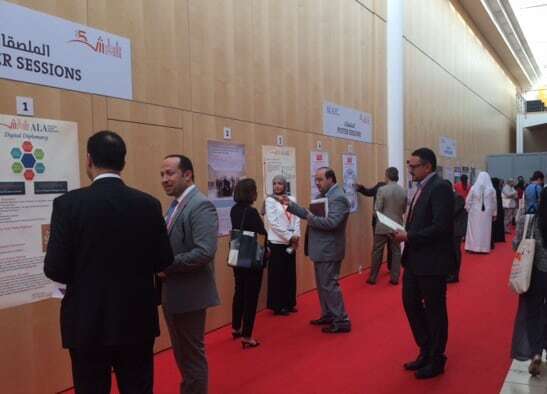 The conference offered participants the chance to learn from international experts from the MENA region as well as from the US. 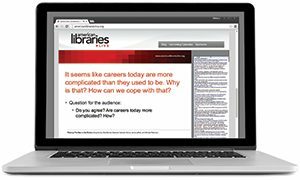 In response to 2015 attendee feedback, the 2016 conference offered more interactivity and focus on specific topics, including in-depth facilitated discussion sections addressing how to build stronger library associations in the MENA region; the importance of research impact and writing for librarians; and successes, struggles, and challenges in school libraries and with reading initiatives. Volunteers who helped organize and manage the 2016 conference pose for a selfie with ALA Marketing Director Mary Mackay and ALA President Julie B. Todaro (back row center). Corinne Hill, director, Chattanooga (Tenn.) Public Library, answers questions during her presentation on creating spaces and activities that attract teens. 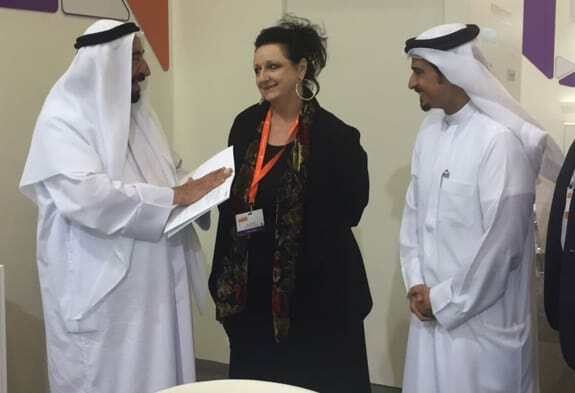 ALA President Julie Todaro (center) chats with His Highness Sheikh Dr. Sultan bin Mohamed Al Qasimi (left) and SIBF Director and Sharjah Book Authority Chairman Ahmed Al Ameri. Participants relax and network in the Librarians’ Lounge. 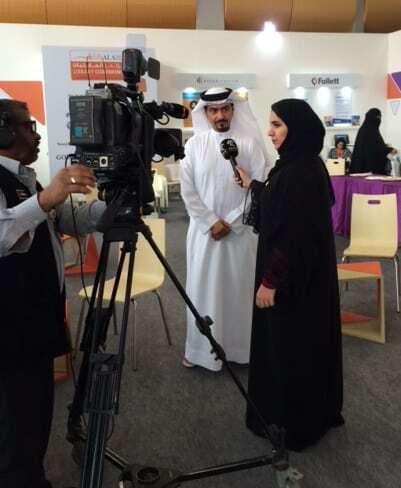 SIBF Director and Sharjah Book Authority Chairman Ahmed Al Ameri is interviewed in the Librarians’ Lounge. Attendees discuss the 20 posters selected for display. 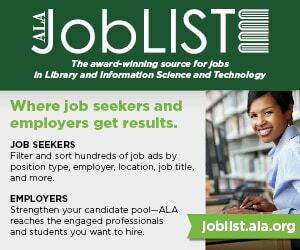 ALA President Julie B. Todaro opened the conference with an update on ALA’s Libraries Transform campaign, addressing library transformation as essential to the communities we serve. 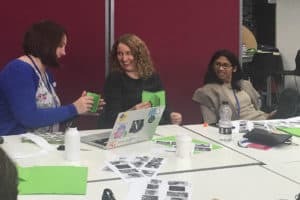 Todaro, whose ALA presidential initiative includes training and highlighting “the expert in the library,” also led a session on how to integrate continuous learning with work. 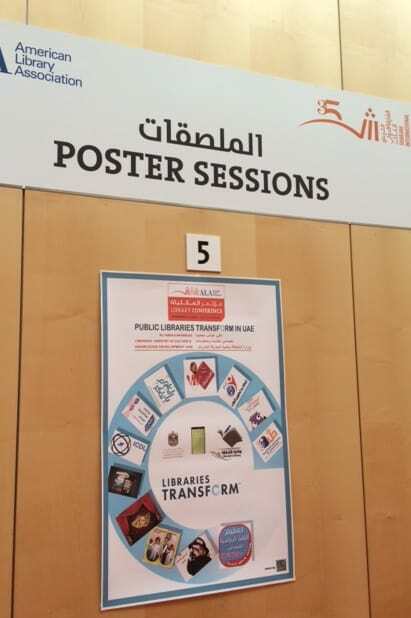 The conference also offered 14 concurrent sessions and a poster session on a wide range of topics for all types of libraries. Groups gathered throughout the conference in the Librarians’ Lounge at the Expo Centre Sharjah. With the tagline “Read More,” the 11-day run of the 35th SIBF drew a record-breaking 2.3 million visitors to review and buy books and other materials from 1,681 publishing houses featuring approximately 1.5 million titles and representing 60 countries. “SIBF’s overwhelming success in attracting such huge audiences each and every day is a testament to the incredible efforts made by Sharjah in the cultural and literary sphere over the past 35 years,” said Ahmed Al Ameri, SIBF director and chairman of the Sharjah Book Authority. 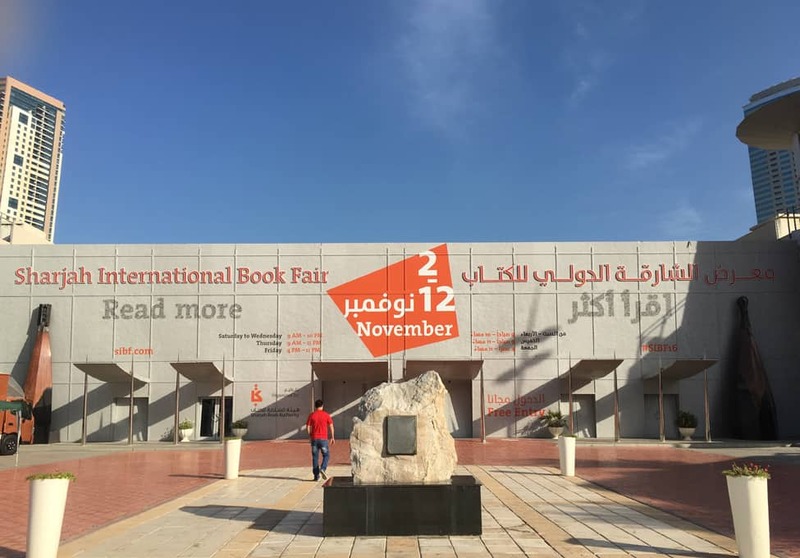 For more about SIBF, visit www.sharjahbookfair.com/.